A new piece for my collection has arrived: an ultra-rare Matra Alice 8000 with LSE cartridge and LSE and Basic manuals. As there seems to be almost no English text on the Alice 8000 available, I compiled the following article from mainly French sources. Apart from compiling existing information this text features data on the ROM size and more photos from the PCB, data on size and weight and warnings about disassembling the unit :-). Mécanique Aviation TRAction or Matra was a French company founded in 1942 covering a wide range of activities mainly related to automobiles, bicycles, aeronautics and weaponry. In 1996 it started to operate entirely under the name Lagardère Group. 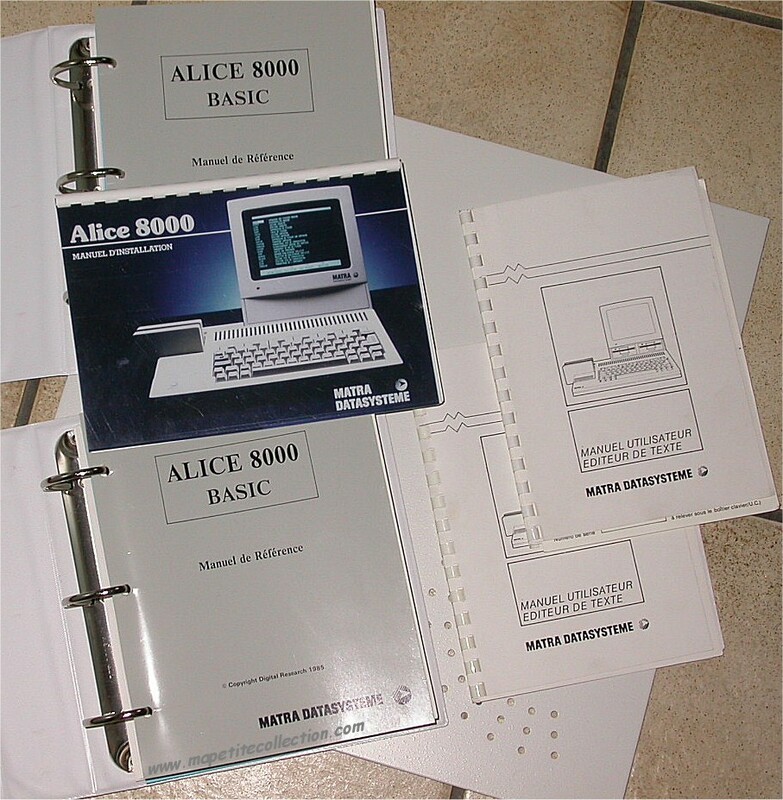 After having failed to conquer the entry systems market for home computers in 1983 with the Alice series of computers in collaboration with the French publisher Hachette (Alice, Alice 32, Alice 90), Matra tried to apply for the French Informatique Pour Tous (Computer Science for All) program with the design of the Alice 8000 (codename Nano) in 1985. A preproduction run of maybe 250 devices has been produced. As the design is said to be too expensive, Matra abandoned all plans to stay in the home computer market and after then concentrated on the business market. This first type of Alices was intended to work diskless via a local network (french: nano reseau, hence the code name Nano) thus using the storage capacities of a server. Two programming languages were developed for (or at least, ported to) this machine. Digital Research’s P-Basic is contained in the ROM. LSE (see section below) is available via a cartridge. LSE uses the 8088 processor. The ROM further on contains a rather powerful configuration menu as well as some file management possibilities (instead of having a DOS). There are 4 ROM ICs on my PCB, with a total of 96 KB. 48 of which account for the Basic, 32 KB are labelled “Nano”, and 16 KB are called “6803”. claims that only 125 Alices have been built (although 250 mother boards have been produced), and 200 cartridges. Out of these machines, only 100 should be functional. Further,  tells that Matra trashed most of these Alices, only 20 machines were sold for a symbolic price to a school, and 10 others were given to developers and other members of the project. Later on the 20 school machines were also destroyed, so nowadays only about a dozen are known to exist (see list below). 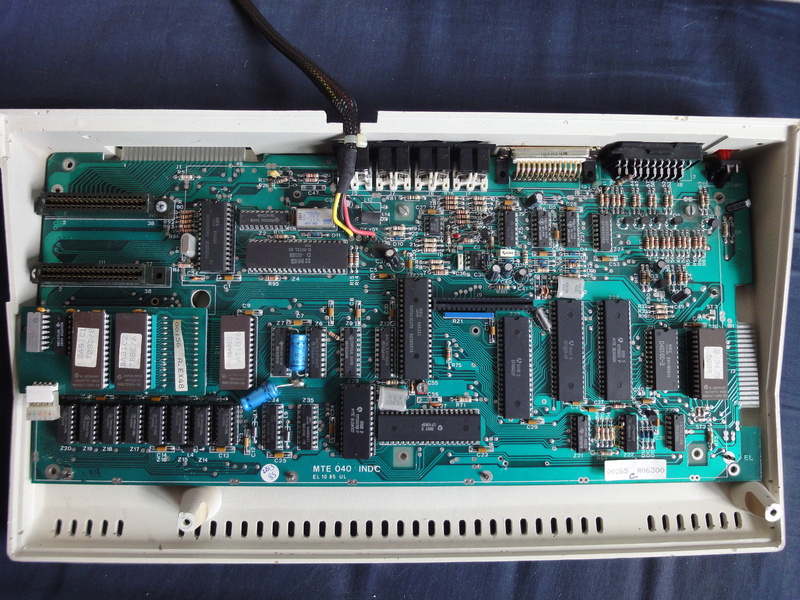 From a collectors point of view the Alice 8000 is extremely attractive because of its rarity, home computer type, the 2 CPUs, and its beautiful design. The keyboard unit contains the computer and most of the interfaces. It has a fixed cable that can be connected to the monitor unit for power. A second, proprietary Scart cable the connects both units video-wise. The expansion port would have probably offered the possibility to connect to a separate LAN module as this was needed from the concept point of view. Attention! If you detach the keyboard half from the PCB, it might be the case that you cannot put back the keyboard connection into the PCB (at least this was the case for my machine)! The monitor unit contains the monitor and the PSU as well as (according to a photo) space for 2 3.5” disk drives (but there does not seem to be any means to connect or control these drives). Attention! 1) it is not easy to put the front and back half together once you opened the case. 2) I was not able to disconnect the two halves due to many cable connections between them. 3) After fiddling with the fuse, the entire fuse component broke off the PCB! LSE or Langage symbolique d’enseignement (Symbolic Teaching Language) is a programming language developed at the beginning of the 1970s for teaching. 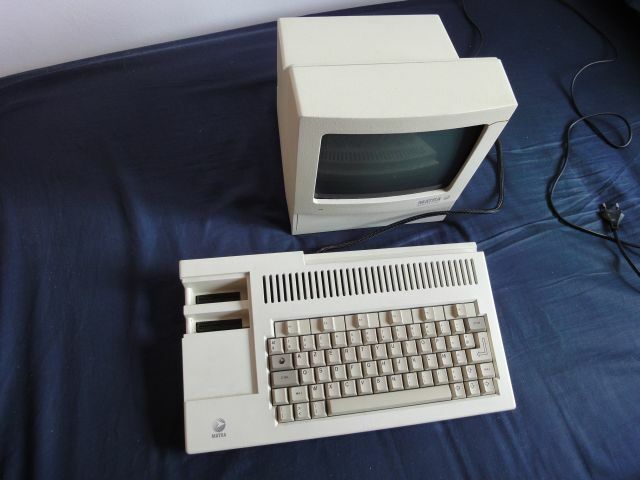 It was widespread in French high schools as a result of an edict of the French ministry of education but vanished quickly with the upcoming of PCs as there was no implementation for these machines. Technically, LSE is similar to BASIC, except with French instead of English keywords. It also supports procedures. 100 PROCEDURE &STROF(N) LOCAL S1,S0;CHAINE S1,S0;S1←"S";S0←"S"
Note that the program contains a procedure STROF (100-160) while the FOR loop in 10 refers to line 20 as the body. The main program starts at 10 and ends at 40. The following pictures have been taken (with permission) from http://siravo.fabrice.free.fr/alice/palice8000.htm .